Spring was here again, which meant the annual Chicago Art Department Trip. This would be my first time going to the art museum with Stritch. We rode the bus down to the museum in the rain. When I got off the bus, the first thing I saw was a wire hanger, multiplied to about 500 times its actual size, perched up on the corner of the roof of the museum. This was a pretty cool piece and it added to the building. Now, the Chicago Art Museum looks nothing like the Milwaukee Art Museum, as the Milwaukee Art Museum is a piece of art in itself, the Chicago Art Museum has to add art to it. I also thought that the Chicago museum would have been bigger. It is in Chicago after all, where most things are larger, but it didn’t seem to hold as much art as I thought it would. Some of the ‘modern art’ these days, I have trouble seeing as actual art at all. It seems to be sloppy and unimaginative; done before. Inside one of the smaller side rooms as you walked up the semi-spiral stairs, was a photography show. Instinctively, I started critiquing the work and looking for inspiration that I could draw from it. I was slightly disappointed. The work was photographs of cut paper, which did create interesting shadowed edges where the paper ended, but you were able to see the tape where the paper was being held together and where it was taped to the wall. This could have been an element left in the photos by the artist, but I just thought it looked like a mistake. The straight, clean edges of the plastic adhesive contrasted the jagged cut edges of the other papers in the photographs and it was too contrasted to really look good, in my opinion. An idea that I had to make it seem as though the tape were supposed to be in the photograph, would have been to use colored transparent tape, as the papers were all white or cream, then a pop of color would have been interesting. 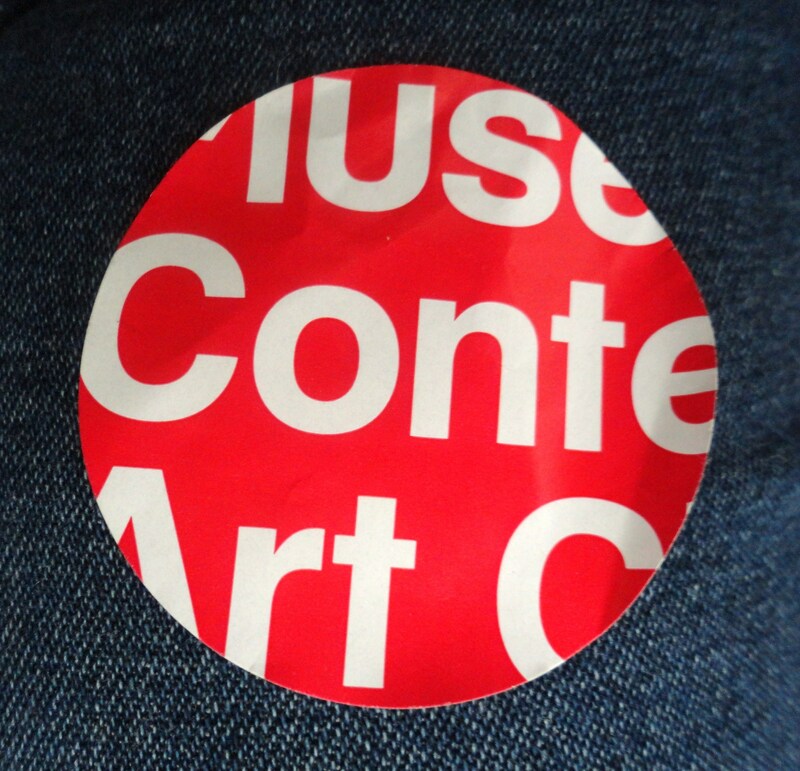 Or the artist could have used double sided sticky tape and eliminated the appearance of the adhesive all together. A few of the more sculptural pieces that were exhibited, I had a hard time seeing them as real art as well. 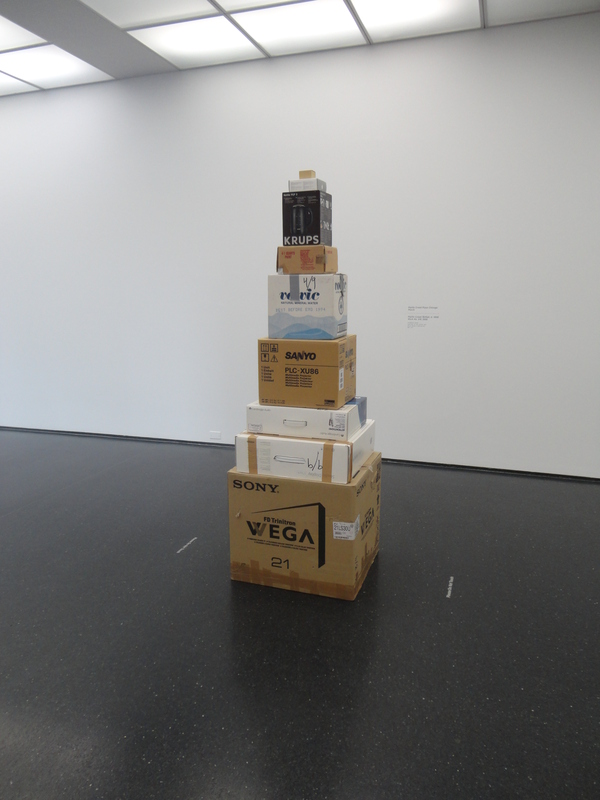 One sculpture was just a bunch of cardboard boxes stacked on top of one another. Anybody could have done that and I am sure other people already have, so why is it considered art? Why was this person’s interpretation of stacked boxes so impressive? In Steve’s class, we had talked about this concept of how something can be so ordinary yet when taken out of its original context and placed in a museum, people see it as art. A concept that I don’t really agree with but it is true. This concept could be carried over to the museum’s store as well, with its two levels of merchandise. The first level had more traditional art museum store type of things available for purchase; books based on artists, postcards with artwork as the image on the front, and trinkets the depicted key pieces in the museum. They even had a book about Frank Lloyd Wright for the clearance price of $200. The lower level to the store was home to more ‘useless’ items that were for sale. Here they had thinks like magnetic necklaces, pens shaped like dogs and human bones, and a big red button that had ‘PANIC’ stamped across it. All of these things were outrageously overpriced as well. I wrote down a few things that I thought would be neat to have but I didn’t really need: a mini Diana camera that took 35mm film and some KOLA cover lenses, each thing I found to be cheaper when bought online elsewhere. After our Modern Art Museum experience, we were able to explore the art district of Chicago on our own. It was during this time that I felt that I really saw some art. It was all in the small local galleries in the district. I was able to see photography that I could see a story in, find furniture that was beautifully crafted, and paintings and sculptures that I could find meaning in. The collections were smaller, yes, but they had more substance to them. 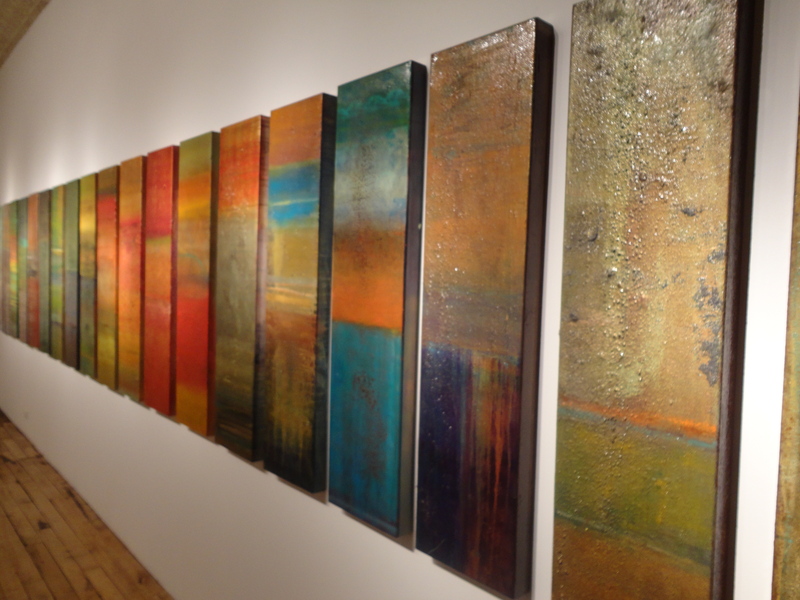 Some of my favorite pieces were a collection of metal plaques that had some substance melted over them that gave off the look of the rainbows that appear when oil is spilled in water. I also saw a painting of leaves which included actual leaves as the very last layer. There was an exhibit of photographs that were blown up to a decent size and then had thin slabs of wax placed over them to ‘fog’ parts of the photo and to keep other parts crystal clear. It was galleries that held these works that made the day worthwhile to me. I have been working with Cardinal Stritch’s Theatre Department set crew for three years now. I have seen every show I have worked on, twelve altogether. I have helped to plan twelve sets, helped to build twelve sets and helped paint twelve sets. 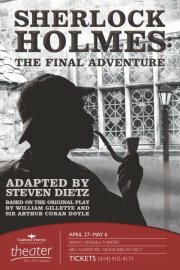 Among my favorites have been Urinetown, Rumplestiltskin, Drowsy Chaperone and now Sherlock Holmes: The Final Adventure. Each of these shows had a different cast, different crew and a different atmosphere. Scenes from these shows included rusty sewers, magical woods, in-flight airplanes, and now steam-punk London. Sherlock Holmes: A Game of Shadows was released in theatres in December of 2011 and we were creating the same storyline, except Live and on stage. Some differences between the shows would be the availability of funding, the locations and the well-known actors. One major difference between these types of performances would be that on stage you only get one shot. This became very evident when the fog machines set off the fire alarms and the entire audience had to be evacuated out of the building. This has only happened twice before to my knowledge during a performance of Rumplestiltskin and The Drowsy Chaperone, when the fog was just too abundant. Our version of Sherlock Holmes, subtracting the minor fire alarm, was very successful. The actors pulled off their roles convincingly well, especially Sean Jackson as ‘Sherlock’ and Austin Gomez as ‘Dr. Watson’. Another favorite character of mine, though a minor character was Christen Lee as ‘James Norton’s Sister’, her character played a character in a character. The acting was all right, no one character really far outshined another and the dynamics of the script allowed for characters roles to be highlighted at different point throughout the show. I got to see the progression of the set from start to finish as I have with many other sets. This one was a bit more detail oriented than the others. We painted seven-color rust detail on windows, doors, gears and other metal pieces to embellish the set. We painted four-layer ‘dirt’ washes and mud on brick walls and the stage floor. We had added two different colors of ‘pipe leakage’ at every connection of pipes and where the waterfall ran. I personally didn’t work on the curtain waterfall as I would have had some suggestions for changing it so it had the same amount of detail as the rest of the set. The lighting on the set pieces and the embellishments on the costumes worked really well with the ‘steam-punk’ theme that they designers were going for. Where the lights landed on the sets, they had hard edges and inorganic designs in the gobos used to create lit shapes by shining light through a piece of metal with the shape cut out of it. The costumes were embellished with small gears and grommets to support the ‘steam –punk’ image. This cultural experience was both had by working with the unique set of set crew workers and seeing a live-preformed piece of art. Theatre people, at least at Stritch, are unique in the way that they are both a bit theatrically nerdy and don’t have a problem with speaking what is on their minds. Working with them for an hour will tell you so much about a particular person, but after having worked with some of them for almost three years, they are pretty close. Seeing the show live is also a cultural experience because you are in the action, as it happens. It is pre-scripted and rehearsed, yes, but one instance would be when the characters are smoking real cigarettes on stage, after a few moments, the audience can smell the cigarettes being smoked. I highly recommend going to see a live performance of any show as it is such a rewarding and thrilling event, if you pay attention to the details. My dad and I share in the love of photography, so about a year ago he subscribed to Popular Photography. In the latest issue, I saw an advertisement for an HDR or High Dynamic Range photography. HDR, basically explained, is taking multiple exposures of the same image and weaving together the best pixels from each image. I looked up a few tutorials on how to achieve this effect in my photography. The first few I looked at I tried to emulate what they did while watching their video, but I got lost and didn’t achieve the same effect as they did. I then found a site that led me through simple steps and it worked better on my photographs. 1) Call your first layer ‘Background’. 3) Change the Blending Option of ‘Black and White’ to Overlay. 4) Layer ‘Black and White’: Go to Image > Adjustments > Desaturate. 5) Layer ‘Black and White’: Go to Image > Adjustments > Invert. 6) Layer ‘Black and White’: Go to Filter > Blur > Gaussian Blur. Adjust to abround 40 pixels. 7) Duplicate the ‘Background’ layer and move it above ‘Black and White’. Call this layer ‘Linear Layer’. 8) Change the Blending Option of ‘Linear Layer’ to Linear Light. 9) Change the opacity of ‘Linear Layer’ to around 62%. The effect is almost surreal. The images look to be natural yet they have the effect of almost glowing and extra details. A few of the tutorials, using programs more advanced than my Photoshop CS3, were able to create images that appeared to be straight from a sci-fi movie, with their extreme detail and contrasting glowing and natural elements. This was my first time trying this type of editing and I think that I was most successful the photograph of the dock ‘Post’ in the water and the bench among the ‘Trees’ photograph. The higher contrast and vibrant colors seemed to match the examples of HDR photography that I have seen before. So, in the process of looking up different designs for a background, I stumbled across a DIY optical design. You are basically making your very own optical illusion with the use of three basic art tools: paper, sharpie and colored pencil. There are only 9 simple steps to creating your own design. 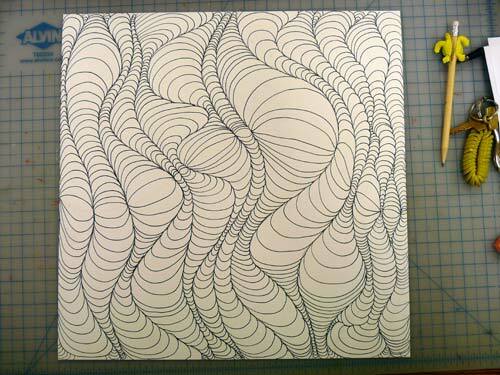 Step 1: Draw 9 or more vertical lines that vary in their amount of wavyness. Step 2: Draw a single horizontal wavy line across all of the vertical ones. Step 5: Connect each vertical line with the ‘U’ curves. Step 6: Shade each section with one color hue to be dark on the edges and lighter in the middle. Step 7: Use an analogous or similar color and create the same gradation in the next section. Step 8: OPTIONAL: Choose another analogous color for the same row or use the original color. Step 9: For the next row, use a complimentary or opposite color hue. The link below has step by step photographs to help explain how to create your own design.